Ten Speed Press, 9780399581427, 204pp. ODETTE WILLIAMS is an Australian expat and baking fanatic who now calls Brooklyn home. After becoming a mother, Odette realized that she couldn't find any keepsake apron sets for her young children to don when they baked together, so she made some herself. Friends started asking for aprons for their own children, and in 2013 Odette launched her eponymous brand. Odette Williams products--including flour scoops and cookie cutters--very quickly got picked up by leading retailers, including J.Crew, Anthropologie, ABC Carpet, Le Bon Marche, and Barneys. 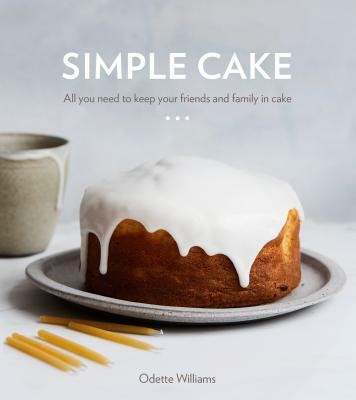 "The premise of Simple Cake is a lovely one: It aims to make baking a cake the kind of thing you do to celebrate life’s little moments as well as the big ones, from a lost tooth to a milestone birthday. . . . This book is perfect for newlyweds, a new parent or anyone looking to make new traditions." "The idea of offering ten base cakes, fifteen toppings, a flavor chart, and dozens of decorating ideas is both fun and ingenious! This might be the only cake book one needs." "Simple Cake delivers quick and easy cakes that you can enjoy any day or dress up for special occasions. The recipes are unfussy and joyful; they are the perfect excuse to share with the ones you love. You will make these cakes part of your baking legacy." "Simple Cake is such a sweet book full of incredible photography, delightfully simple recipes, and so, so much love. It's as deeply personal as it is useful and I can't wait to bake from it." "Odette Williams loves cake. Her book, a collection of "unfussy, classic recipes" that she's been perfecting for years, is all about delivering on your cake craving, even if life wants to get in the way. The recipes are simple and achievable: She offers 10 base cake recipes and 15 topping ideas that can be mixed and matched to fit your dessert needs, wants, and desires."